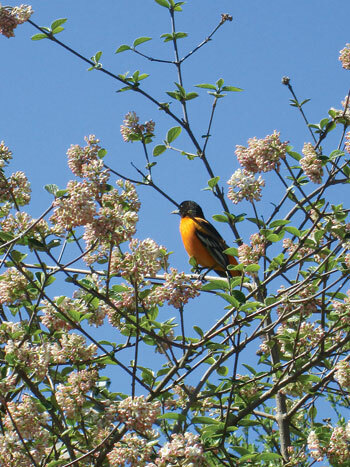 Join the Branford Land Trust for its second 2015 Winter/Spring Lecture as DEEP Wildlife Biologist Peter Picone presents CREATING SEASONAL HABITAT FOR SONGBIRDS USING NATIVE PLANTS, on Wednesday, February 25, 7:00 p.m. at the Blackstone Memorial Library. A lifetime Connecticut native, Peter has been working as a wildlife biologist for over 25 years and will share his insights on creating seasonal habitat for songbirds using native plants. Have you ever wondered where the Northern Cardinal or the Downy Woodpecker rests at night? What does the American Goldfinch really eat in the wild? What do songbirds like the Scarlet Tanager or Wood Thrush feed on in the fall when the frost hits and there are no more insects to eat? What variety of foods does the Wild Turkey feed on in your neighborhood? In the dead of the winter, what do our resident songbirds eat? What plants provide winter food sources at a time of food scarcity? When you choose a plant for your property are you considering its ecological function and how it enhances wildlife habitat? Come to Mr. Picone’s lecture and you will learn that you can make a difference for wildlife in your surroundings by the plants you choose to plant and their arrangement. All Branford Land Trust lectures are free and open to the public. Upcoming 2015 lectures include “Fight the Bite: Ticks and Lyme Disease” with Kirby Stafford III on March 24; and “Sea-level Rise: Implications for Our Coastal Wetlands” with Shimon Anisfeld on April 22.